Have you been looking for a chiropractor in Grand Rapids? It's sometimes difficult to find a doctor unless you know someone that first goes to one. Most of our patient's arrive at our office through word of mouth. We pride ourselves on achieving amazing results, and because of that, people are excited to share with their friends and family our office. When people are making progress and getting better, the first thing they want to do is share it so that they can experience the same results. 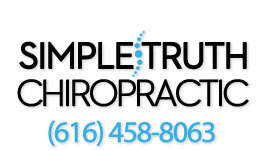 At Simple Truth Chiropractic, our goal isn't to help you just get out of pain. Our goal is to create personal transformations for each and every individual by educating people on what it takes to be healthy. We're here to guide you and support you in your health goals to take you from where you are to where you want to be. We do that through specific chiropractic care, lifestyle education thru workshops in our office, and weekly handouts, blog posts and Facebook posts. Given the option, most people would rather prevent disease and illness before it ever occurs. We focus on teaching you exactly how to do that. We see a lot of different conditions in our office for adults, including neck pain, headaches, back pain, migraines, joint issues, digestive problems, menstrual problems, etc. We also see a lot of children that have troubles with ear aches, asthma, ADD/ADHD, bedwetting, scoliosis, poor posture, etc. If you're looking for an answer to how to get healthy in Grand Rapids, don't wait another second to begin your road to recovery! At Simple Truth Chiropractic, our chiropractic techniques can assist patients with the rediscovery of health and wellness that had been previously known but long lost. For others, the chiropractic journey may offer a new sense of balance and wellness that one has never before experienced. If you want to start living every day pain free, call us at 616-458-8063 to schedule an appointment! People around the world are recognizing the benefit of seeking an alternative to traditional medicine; one that will help them achieve and maintain optimal health without requiring invasive treatments such as addictive drugs or surgery. At our office, we focus on structural correction rather than treating and managing the symptoms. For a comprehensive structural evaluation, fill out the form or call us today.